Perkolator Press was established in 2005 in Tuscaloosa, Alabama, by my identical twin sister Amy Pirkle, a book artist and letterpress printer. For over ten years, Amy and I have collaborated on several book projects, prints, and broadsides. This series of tunnel books examines how a shared place can influence identical twins in different ways. Each book contains one of my poems and the imagery that accompanies each poem centers on a place that holds some significance to both of us. We began collaborating on this series in 2016 while Amy was in the May I-Park Foundation’s Artists-in-Residence program in East Haddam, Connecticut. Imagery is pochoir and painting with archival pigment inks, while text is archival inkjet printed. Each book is one-of-a-kind. 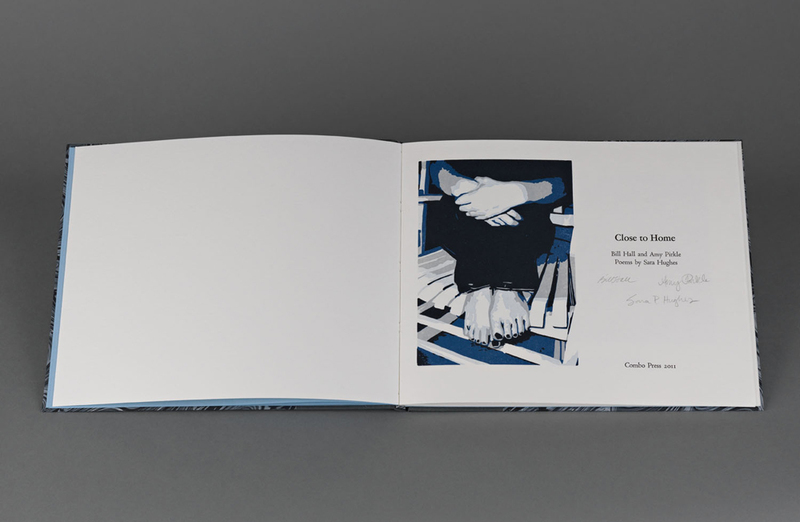 Hands features the poem “My Twin Sister in the Print Shop,” which is one in a series of ten poems I wrote about hands. The first line states “Our hands are matching origami kites.” As Amy puts it, "the pop-up kites that represent us, so boldly colorful and prominent at the beginning of the book, begin to grow smaller and fade away as the poem continues." The book has been letterpress printed from handset metal types, with linocuts and pochoir imagery, on Johannot mouldmade paper. 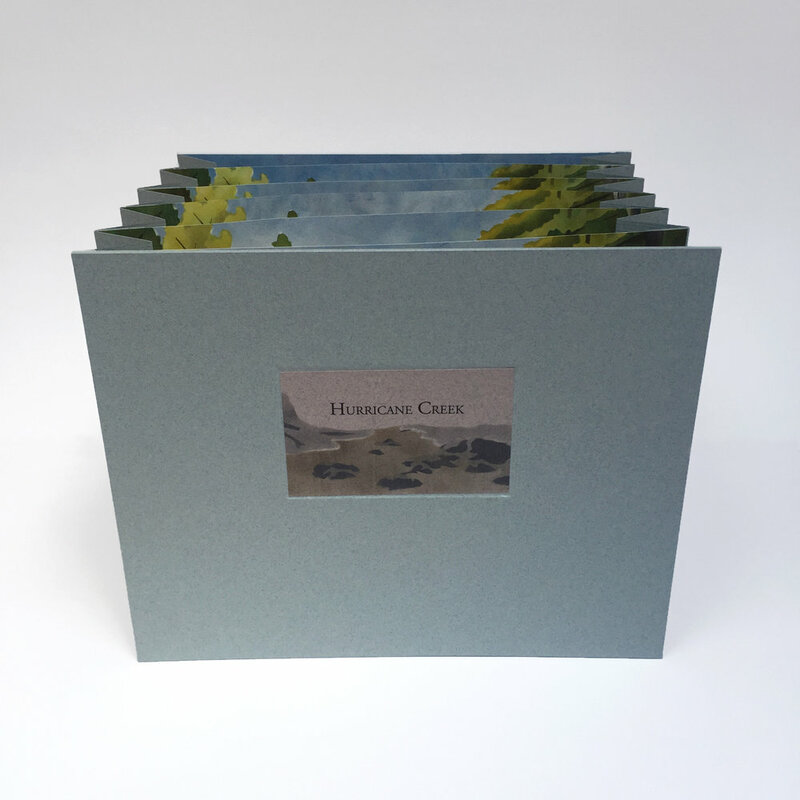 Designed, printed, and bound as a double-leaved accordion with 14 pages. From birth through our senior year in college, my twin sister and I shared eight bedrooms, and each page in this book presents a specific memory each of us formed in that place. Amy and I both wrote the text for the book; Amy letterpress printed her memories in red and mine in green. On each page, Amy used a pochoir technique to create a matching circle to represent where each of us slept in that room. Amy drew the floor plans of each bedroom as closely to scale as she could remember them, then carved the images from linoleum. These drawings were scanned and converted into small photopolymer images for the title page and cover imagery. The papers are Hahnemuhle Bugra in mint green and sapphire blue, with a spine piece of Aqua Iridescent Asahi bookcloth. 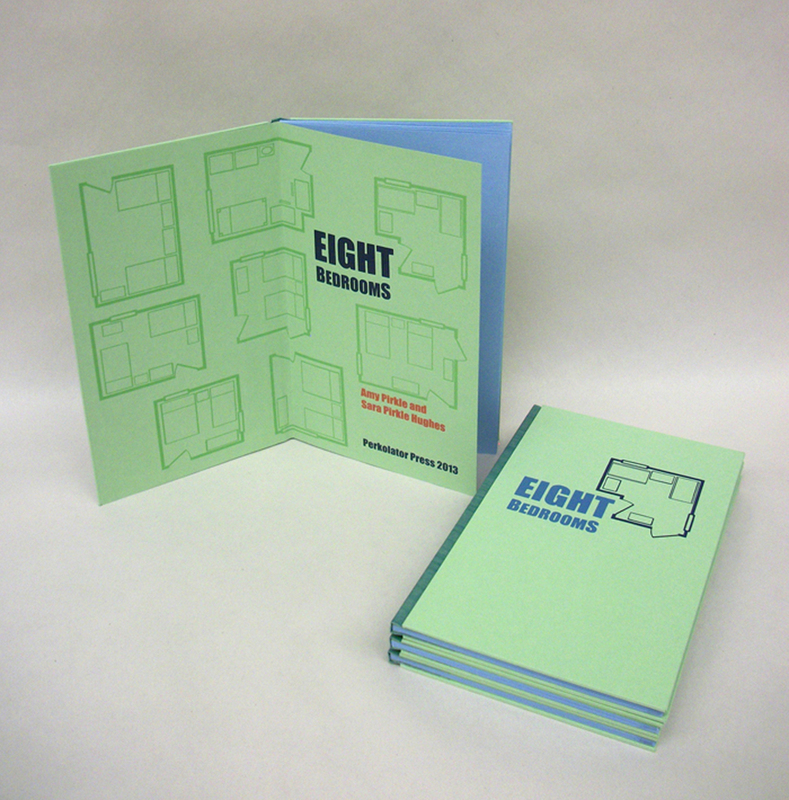 Eight Bedrooms is bound as a drum-leaf with 20 pages. That Edge features my poem “That Edge," which was originally published in Ouroboros Review, Issue 5, under the title “The Secret of Life.” I wrote it as a response to Denise Levertov’s “The Secret.” This book was printed on Hahnemuhle Copperplate paper in an edition of fifteen at Combo Press, the joint press of former master printer at New York's Pace Prints, Bill Hall, and Amy. Aquatint etchings are by Bill; letterpress, book design, and binding by Amy. 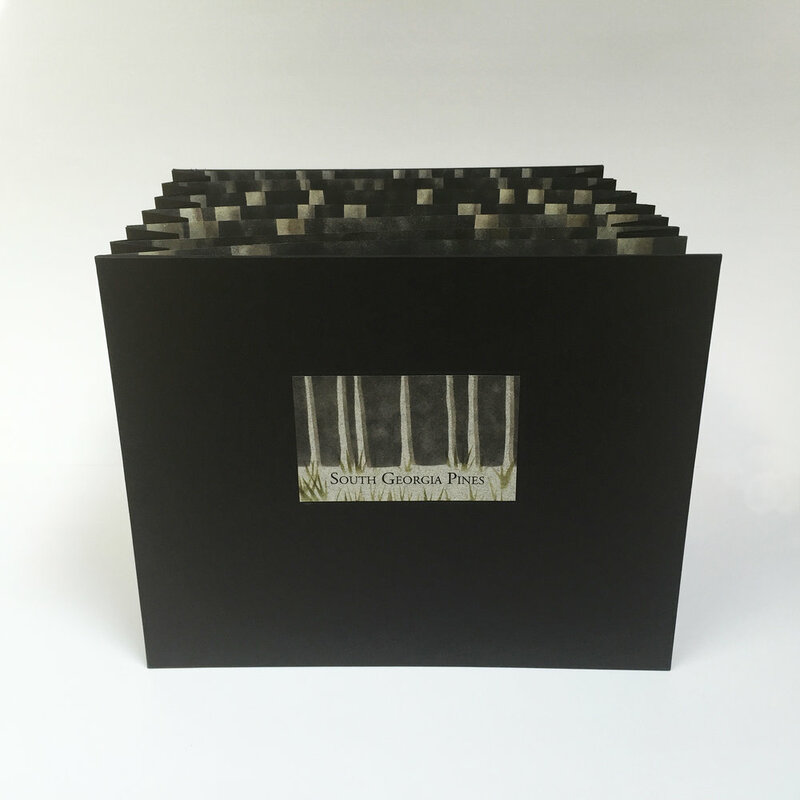 The boards are covered with black Asahi bookcloth, with an aquatint etching inlaid on the front cover. The accordion spine is red Moriki paper. 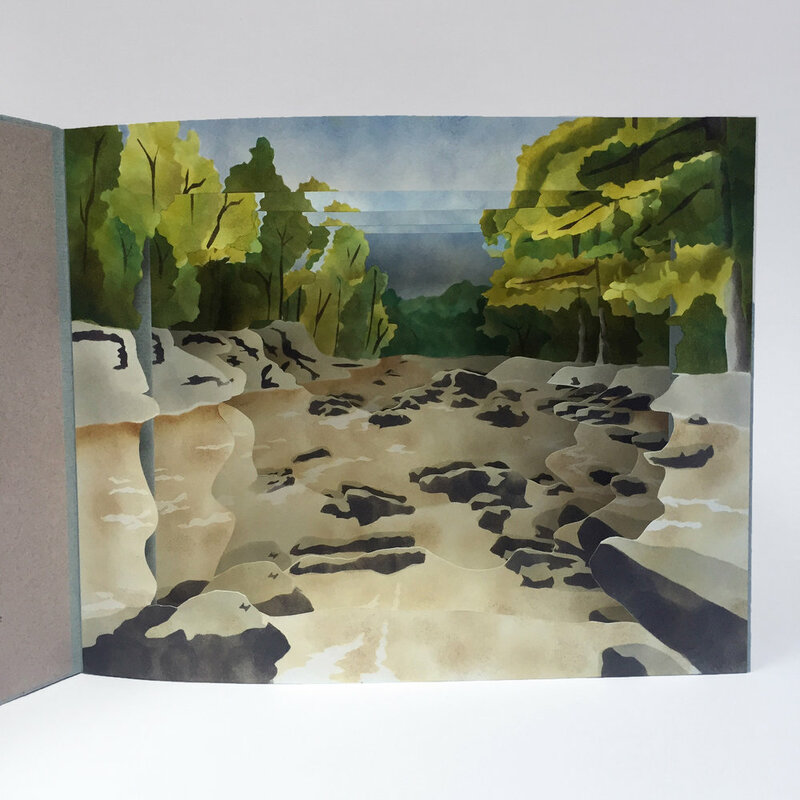 It was bound in 2013, in a hybrid style between an accordion book and a flag book. This is the first book published by Combo Press. Established in 2010, Combo Press is the collaborative effort of Amy and Bill Hall. They first met during the 2010 winter residency at Penland School of Crafts, where Amy was the master printer in letterpress, and Bill was the master printer in printmaking.The two poems I composed for this project, "One Song" and "Reflection," attempt to tie their visual ideas together. Amy’s reduction linocuts and Bill’s aquatint etchings are printed on Magnani Incisioni paper. The metal type, Centaur, was handset and letterpress printed by Amy, who also bound the book. The book has been case-bound with Brillianta cloth and French Marbled paper, and has Hahnemuhle Bugra endpapers. This book was letterpress printed on Japanese-style Alabama kozo paper, handmade by Amy in the fall of 2005. This haiku-stanza poem, which I wrote as an undergraduate at Mercer University, illustrates the life of our grandmother Kiyoko, who was uprooted from her family in Japan as a young woman and forced to start a new life in America in the unforgiving Georgia of the 1950s. This book was printed from metal types and reduction linoleum blocks, and bound in a variation of the Japanese stab binding. Deluxe edition is cased in a variation of the Japanese portfolio structure, with bone clasps.